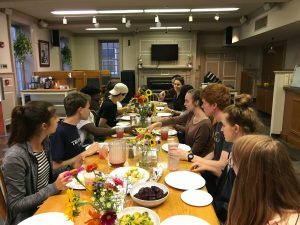 Professor Rebekah Pite (History) and Ana Luhrs (Kirby Librarian) teach First-Year-Seminar students how cookbooks are much more than simple collections of recipes. When approached critically, they allow us to analyze patterns of daily life, domestic ideals and practices, and power relations in the societies in which they were produced and consumed. 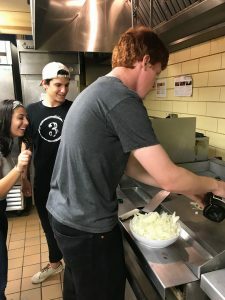 This semester, the class harvested vegetables at the college’s own farm “LaFarm” and used the harvest to prepare a delicious meal at Gilbert’s. 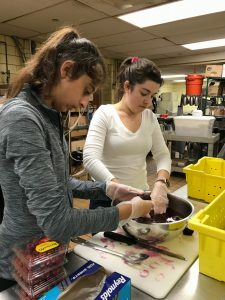 They used historical recipes from the following cookbooks: “Fannie Farmer Cookbook”, 1896, “The New York TimesMenu Cookbook”, 1966 by Craig Claiborne, and “The International Jewish Cookbook”, 1919 By Florence Kreisler Greenbaum.